A very nice article, using the Scientific Method, about the Viking warming period. This is a good study, because it quantifies the Medieval Warming period much better than looking at crop distribution and historical records. Those guys weren't big on writing. 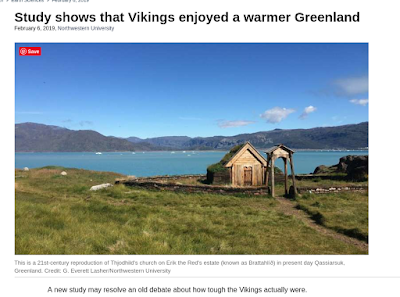 The article gets top marks from me for not mentioning that the Vikings breathed out carbon dioxide, or killed all the natives. They even mention ocean currents, yeah!